Danny Zacharias over at deinde has been very busy not only locating and organizing digital flashcard programs but also creating his own data sets. He's been posting separate blogs for various grammars so people can leave comments more easily, but you can see his accumulated work HERE. He reports datasets for Greek grammars by Stevens, Mounce, Croy, Black, and Duff as well as ones based on passage/frequency. For each of these, he lists resources (both free or for purchase) for Mac, PC, Palm, PocketPC, iPhone/iPod. I can add a few other options to his list. 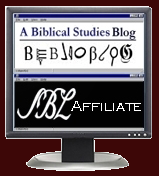 First, some of the Bible software programs have flashcard resources. BibleWorks has free, user-created vocab files (scroll down to the vocabulary section) for Greek grammars by Mounce, Baugh, Black, and Croy and for Aramaic by Johns along with a few others. If you buy Futato's Hebrew, it comes with vocab lists too. Davis' Greek is part of the base package and includes vocab lists as well. There is a flashcard feature you can use within the program (which includes sound files using Erasmian or modern Greek), and you can also print out vocab review sheets as well as standard front/back vocab cards. Logos has a ton of free vocab lists available for Greek grammars by Mounce, Swetnam, Machen an others; for Hebrew grammars by Weingreen, Futato, Seow, Kelley, Lambdin, and others along with some Aramaic (Greenspahn, Johns) and Akkadian (Caplice). You can use the lists generated to print out standard front/back vocab cards. Accordance can be used to create vocab lists, but it does not have a built in flashcard program or flashcard creator. Mark Goodacre at NTGateway lists Wordbase (Greek-English Hangman!) and QuickMem Greek (with vocab based on Metzger's Lexical Aids) among others. VocabWorks - A free program (requires Internet Explorer) that is quite nice. It has a test editor and a number of styles of tests (standard, matching, multiple choice, pictorial). There are free vocab sets in Greek for Dobson, Mounce, Wenham, and a number of other based on vocab features. There are a few for Hebrew/Aramaic based on passages. You can also get a start on Meroitic, Ugaritic, and Middle Egyptian! 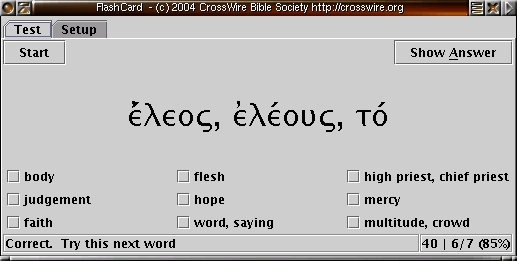 The CrossWire Bible Society offers a free FlashCards program that runs as a Java app. It has an editor but comes with datasets for Greek (Black, Mounce, parsings, frequencies) and Hebrew (Wegner, parsing, frequencies). Valodas - A free program for Windows/Linux/Mac that can be used to create your own dictionary or download one of the many dual-language ones already available for free. Quality varies, and most are aimed toward modern usage (not biblical)... The Latin/English is pretty good. The Greek, not so much. No Hebrew. It is specifically for Greek and Hebrew and deliberately uses .XLS files for easy editing of data sources. 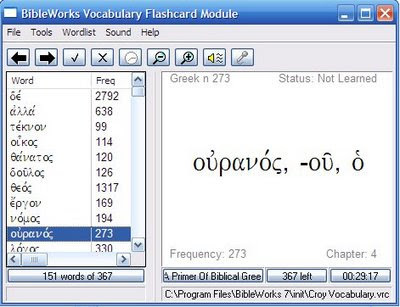 Flashcards are an essential tool for learning Greek, Hebrew or Aramaic vocabulary, and the Flashcard module in BibleWorks is one of the best. Flashcards allow you to focus on words you are struggling with, take out words you now know, randomize the order of words, and much more. Writing new Hebrew words in a notebook is much less effective than using flashcards.